The hormone estrogen has been linked to everything from tumor growth to neuron loss during Alzheimer’s disease. But detecting very small amounts of it in blood and other biological fluids can be difficult for health researchers. 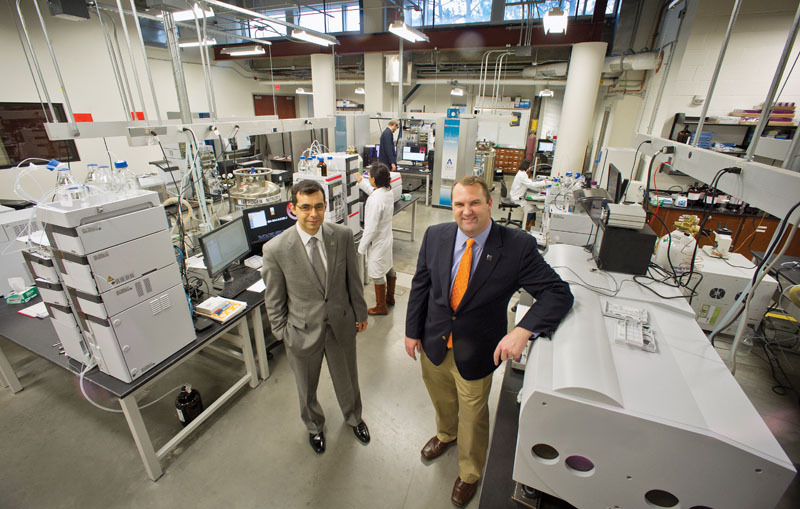 That’s why UTA scientists are collaborating to apply the advanced mass spectrometry and chromatography instrumentation available at the Shimadzu Institute to detect trace amounts of estrogen at less than 10 parts per trillion in a 100-microliter sample. Mass spectrometry and chromatography are ways to separate, identify, and quantify molecules in a complex mixture. Many current estrogen-detection methods rely on the use of an antibody, a type of protein-detection system. These are more time-consuming, less reliable, and require a larger sample than UT Arlington’s new process, which can be accomplished in less than 25 minutes (including sample preparation) and uses only 100 microliters. “This new method pushes the detection limit for estrogen to a level that is applicable to research, human health, medicine, and environmental analysis,” says institute Director Jose Barrera.